MUMBAI: Indian police said yesterday they had arrested six members of a far-right political group over an ink attack on an activist who organised the launch of a former Pakistani foreign minister’s book. As he left his Mumbai home on Monday, Sudheendra Kulkarni had ink thrown on him by a group of activists from the Hindu nationalist Shiv Sena party, in the latest apparent attack on free speech in the country. “We have arrested six men, they are all Shiv Sainiks and have been released on bail,” Mumbai Police Deputy Commissioner Dhananjay Kulkarni told AFP. 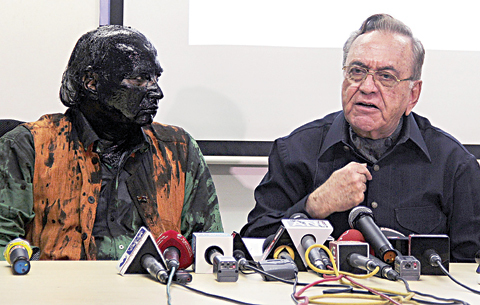 Sudheendra Kulkarni condemned the incident as an “assault on democracy” as he addressed the media in Mumbai on Monday, his face and hair covered in ink. The launch of Khurshid Mahmud Kasuri’s book “Neither a Hawk nor a Dove: An Insider’s Account of Pakistan’s Foreign Policy” later passed in the western Indian city without incident. India and Pakistan have been bitter rivals since gaining independence from Britain in 1947, and have fought three wars. The Shiv Sena, a junior partner in a ruling coalition with the Bharatiya Janata Party in the Maharashtra state government, was last week accused of using threats to force the cancellation of an appearance in Mumbai by Pakistani singer Ghulam Ali. There are growing concerns over freedom of speech in India after the execution-style killing in August of M.M. Kalburgi, a leading secular scholar who had angered hardline Hindu groups.